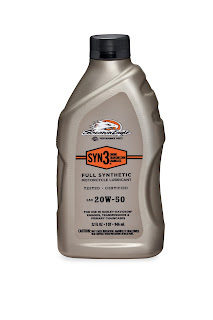 Harley-Davidson® Genuine Motor Accessories® has upgraded the formula and packaging of three of its key lubricant products. Screamin’ Eagle® SYN3® Full Synthetic Lubricant (P/N 62600005, $11.95 quart) and Genuine Harley-Davidson H-D® 360 Motorcycle Oil 20W50 (P/N 62600007, $7.49 quart) are now blended with a cutting-edge polymer viscosity modifier (VM) to improve cold-temperature flow, maintain fluid thickness better when hot, and reduce viscosity breakdown so the oil remains fresher for a longer period of time. Recommended oil-change intervals remain the same. Formula+ Transmission and Primary Chaincase Lubricant (P/N 62600004, $8.95 quart) is also updated with a new and specific VM that adds thickening efficiency and improves shear stability by more than 30 percent. The new formula provides better film thickness and permits better load carrying capacity and bearing protection in the transmission. SYN3, H-D 360 and Formula+ are now packaged in a new one-quart bottle featuring an ergonomic shape and a spout that pours 30 percent faster with an “anti-glug” design for easier flow control. The bottles have new film-coated labels, a view stripe to show the amount of oil, and are Plastic Identification Code #2, which can be recycled in most locations.